When you’re writing a Silverlight application, such as Windows Phone 7 application, it is common to have a value one one page and want to use the value on another page. A good solution for this situation is to use application resources, or to be more specific using the ResourceDictionary for the current application. You can access to the application resources using the Application.Current.Resources property. If you use application resources frequently, you’ll find that working directly with Application.Current.Resources is a little tedious and can clutter the code with details of working with the ResourceDictionary object. I like to wrap these details in a general purpose ApplicationResources class, and then use that class to implement an ApplicationProperties class specific to my application. It provides a nice degree of abstraction, making my application easier to write and later read, and the right amount of reuse across applications. Let’s start with the ApplicationResources class that I can use without alteration in any WP7 application. This class encapsulates the low-level details of working with application resources. I’ve remove most comments for readability, but you’ll find them in the source code download, see below.
? default( T )          // return null for reference type, 0 for numeric value types, etc. The ResourceDictionary stores resources as System.Object types, so the GetResource<T> method adds type safety to the return type. It also deals with two related considerations. First, it is possible for an application to try to get a resource before setting the resource. Rather than flagging that situation as an error, e.g., by throwing an exception, and making the consuming code deal with that, I’ve opted to return a reasonable default value when getting resource before it is set. Second, the resource type might be a value type (such as bool, int, or a struct) which cannot be null. Now, using a key to index into a ResourceDictionary that does not contain that key will return null. That’s an acceptable value for reference types, but will generate an error for value types. The default keyword for generics provides just what is needed for both value and reference types. The SetResource method hides a distracting little detail that application resources are not mutable: once a resource has been added to the ResourceDictionary its value cannot be changed. However, you can create the illusion of changing a resource’s value by first removing the old resource, if it exists, and then adding the new resource. While the ApplicationResources class successfully encapsulates most of the details of programming with application resources, it does not address the question of managing the keys used within an application. That’s next. I really want to avoid unrestricted use of string literals as application resource keys, sprinkling them throughout my code. The big problem with that is what happens when one of those string values changes, or I just type it wrong in the first place. A string value is a string value, my code will compile without error, and I’ll be faced with debugging a problem that can be extremely subtle to detect. So I like to create an ApplicationProperties class for each application that is the exclusive consumer of the ApplicationResources class in the application. /// Properties backed by application resources. // A key can be an object of any type. Strings are used here for readability. This class encapsulates the keys used for application resources, and makes the resources available as properties. The setter method also strengthens the type-safety, since the property enforces that the getter and setter use identical types. Since this class is specific to each application that I write, I can customize it as needed. For example, I can create a read-only property by marking the visibility of the set method as private. Or I can insert additional logic in the getter and setter to match the data semantics of my application. Putting it all together, I have created a sample Widows Phone 7 application containing two pages. Values set on PageOne are consumed on PageTwo. When navigating away from PageOne, the event handler saves a value from a TextBox control on the page into the UserText application property that I created above. The syntax is clear and simple. Another event handler is invoked each time a a CheckBox control on the page is checked or unchecked, and the handler sets the UserLikesPears application property accordingly. That leaves open the possibility that the CheckBox may never checked before navigating away from PageOne. That works in a completely natural way in the consuming PageTwo. When PageTwo is navigate to, the UserText and UserLikesPears application properties are used in setting the text on different controls. If the bool UserLikesPears property was not set on PageOne, the default value for bool (false) is provided. Since the CheckBox on PageOne is initially unchecked, this default value works correctly. You will need the Windows Phone SDK to compile and run the sample code. I want to discuss some interesting topics about services, notably service versioning. Let me start by looking at a very simple REST service using WCF Web HTTP services, creating one to explore how it is put together. Start by creating a new WCF Service Application project in Visual Studio with File | New | Project | Visual C# | WCF | WCF Service Application and name it AcmePaint. In the Solution Explorer, delete the generated Service1.svc and IService1.cs files. Right-click on the project in the Solution Explorer and select Add | New Item | Visual C# | Web | WCF Service and name it Colors.svc. The service contract is expressed as an the interface IColors with the [ServiceContract] attribute; that part hasn’t changed since WCF was introduced. Edit the IColors interface to define two operations like this. The GetColor method is our archetypal method for performing an HTTP request with the GET verb. The [WebGet] attribute tells the WCF infrastructure that this method is invoked using GET, and the UriTemplate named parameter declares the structure of the URL. The id parameter is written in curly braces which declares that its value in the URL will be passed to the method each time the method is invoked. The PostColor method is our archetypal method invoked using an HTTP request with the POST verb as declared with the [WebInvoke( Method = “POST” )] attribute. Here UriTemplate declares that it uses the same resource name, Color, as the GetColor method, just without any following URL parts. Note that both methods use the Color class for the resource sent (POST) and received (GET) by the service’s client. Edit the Colors class in Colors.svc.cs which implements the IColors interface. 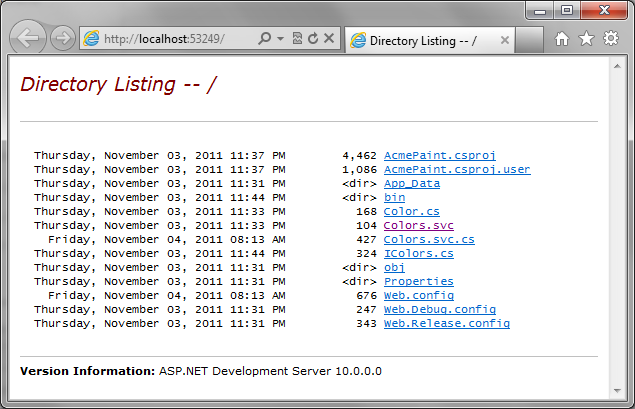 You can get to this file by double-clicking on the Colors.svc entry in the Solution Explorer. I am going to be focusing on getting data in and out of a service, so the implementations here are intentionally bare bones. In the Solution Explorer, right-click on Colors.svc and select View Markup. You should see that it s a one-liner containing the following. Aside from declaring the implementation language and enabling debugging, this file associates a service name, AcmePaint.Colors, with a source code file containing the class that implements the service. We’ll see that service name again in our next step. Open the Web.config file and replace its contents with the following. The <service> element declares the service name using the same value we saw in the Colors.svc file. Inside of that element we declare a service endpoint. The address attribute is empty which means that the endpoint address will just be the address of the Colors.svc service. The contract attribute names the interface that is our service contract. And the kind attribute declares this endpoint to be a standard web HTTP endpoint, which uses a fixed webHttpBinding. That is a binding configures endpoints to respond to HTTP requests instead of SOAP messages. The standardEndpoint element has an empty name, making this the default for all webHttpEndpoints. We’ve used this default to enable help and to set the default format for outgoing response messages to be JSON.. In the AcmePaint project in the Solution Explorer, double-click on the Properties item to display the AcmePaint properties window. Select the Web tab. In the Servers section, verify that Use Visual Studio Development Server is selected. In the Solution Explorer, select the AcmePaint project, then press F5 to run the project in debug mode. Selecting a node in the Solution Explorer first is important! Otherwise, e.g., if you have the Colors.svc.cs file open and selected (active), then pressing F5 to run will launch the WCF Test Client which will display an error because this service is not exposing metadata. 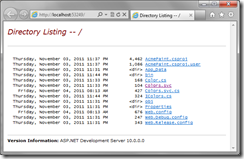 Be patient for a moment while the ASP.NET Development Server starts up, and then your browser will launch a page with the URL http://localhost:xxxx/ where xxxx is the auto-assigned port number that was listed on the AcmeProject Properties page where you selected to use the Visual Studio Development Server. In the browser address bar, edit the URL to read http://localhost:xxxx/Colors.svc/help, using the same port number for xxxx as before. This is the help page that we enabled in configuration. Close the browser to stop debugging the service. We created a minimal REST service and used a browser as an impromptu client to GET a resource, with the response data being delivered as JSON. Sometimes during development I want to have a light-weight approach to logging request and response messages without setting up WCF tracing.​ Regardless of how I am logging (Trace, EntLib, whatever), I need to get a printable version of the data message. I always recommend treating DataContract classes strictly as data transfer objects (DTO), that is they exist purely for describing the shape of the message on the wire. That means I don’t add any fancy constructors or business logic of any kind to the DTOs. This maintains a separation of concerns. However, all CLR types do have a ToString method, so I an fine with putting it to better use than telling me the name of the type. In the sample code, CreateSecretRequest overrides ToString using a static helper method, Helper.ToXmlString. That helper method wraps an XmlSerializer and a StringWriter together to serialize the DTO to a string of XML that I can log. All DataContract classes can use the same ToXmlString method to implement their override of ToString in a simple one-liner. Be careful! This is not the same XML that the service sent or received on the wire. Use WCF Tracing to see what is really happening with your services. This is nearly a 100% genuine approximation of the message, suitable for some quick-and-dirty logging or debugging diagnostics. Are you having a little identity crisis? Not sure who you really are in a given environment? Or what groups you belong to? Find out for real, for sure. Get the name of the current WindowsIdentity (Windows user) and the groups to which the user belongs. This nugget of code has saved me at least three times when I was convinced that I was someone else or in some other role/group than I really was. The SQL MERGE statement, introduced in SQL-92, is the best way to update columns in a table if the the row exists, or insert a new row if the row does not exist. This is performed in a single T-SQL statement. The source code below updates or inserts values into a Prices table that has a Name and Price column. This combination of update-or-insert values is known by the portmanteau ‘upsert’. I read it on the Internet so it must be true. processes the headers in the opposite order in which they are specified in the request. And that’s not awesome in a good sense. The IncomingWebRequestContext.GetAcceptHeaderElements method returns a System.Collections.ObjectModel.Collection<T> and that is not a class I own or can change. But still I’d like an iterator for Collection<T> that yields up its elements in reverse order so that I can still use the foreach syntax. Since Collection<T> is not a class I can modify, extension methods come to mind. Here’s an extension method for an iterator on Collection<T> that does the trick. Now I can write the foreach loop to use the extension method. I am still dumbfounded that GetAcceptHeaderElements reverses the order of the elements (why would that ever be good?) but a few lines sends me on my way without cluttering up the code. I look at a lot of code. Code that was written a long time ago and those coders have long since left the building. Code that someone once cut their C# teeth on. Code that only its mother could love. A common shortcoming is writing out what should be a table look up with flow control logic. Here’s an example of what I mean. There’s no joy in this code. If the enumeration is prone to change over time, support and maintenance of this style of code quickly becomes error prone. And why is there a default return value at the end of the GetDiscountUsingIf method? Is it a hedge against additional values being added to the enumerations? Only slightly better would be to convert if/else-if structure to a switch statement. This time the reason for having a default clause is that without it the compiler will warn that not all code paths return a value. Switch statements are cumbersome (e.g., with the potential for fall-throughs, etc. ), the performance isn’t great (average number of comparisons is N/2, and worst case in N comparisons), and I think switch statements in general tend to be overused. So every time you see a switch statement I encourage you to think hard if it can be replaced. In this case, it is easily replaced with a Dictionary from the System.Collections.Generic namespace. The discounts dictionary structure separates the relationship of the keys and values from the lookup logic. The indexer property, discounts[ type ], does most of the lookup logic, and at O(1) it is more efficient than the O(N) linear search approach of the previous two solutions. With the key-value association and lookup work taken care of with pretty terse syntax, the code is simple enough that I can contemplate what should be done with an AccountType key that’s not in the table, in this case throwing an exception that the argument is out of range. So the next time you’re got a job that is essentially a dictionary look up, use a Dictionary to look it up. These are my views and opinions, and don't necessarily represent those of my employer. As if you didn't know that.